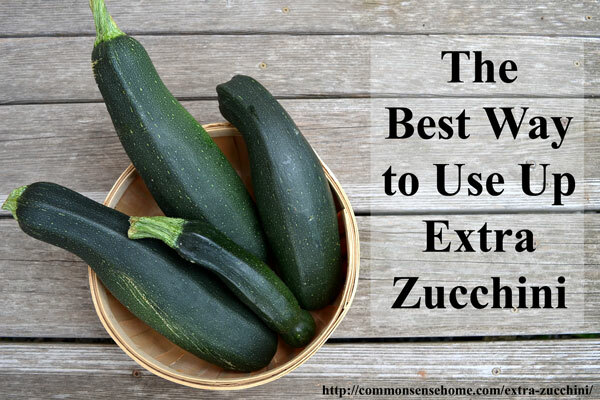 This time of year, many gardens and kitchen counters are filled with extra zucchini. I'm still short of rain, so my zucchini plants are only puttering along, but luckily my friends have been more than willing to share their bounty of overgrown zucchinis. Last week I processed a small mountain of large zucchini, and my Facebook friends were asking what the heck I was going to do with them. So here's my not-so-secret method for using up large amounts of zucchini quickly and easily. When I dehydrate zucchini, I only remove the skin if it is particularly tough. (This year I tried a different variety, and the skins are like leather.) Large seeds are removed, along with the center pith – I basically fillet the squash. I shred the zucchini very finely with a food processor or grater – the more surface area, the better. Let strain in a colander for 15-20 minutes, squeeze out as much water as possible to reduce drying time. Make Sure Your Zucchini is Dry Enough! 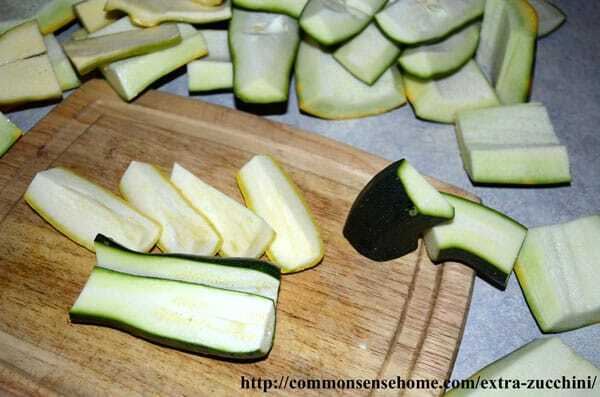 The zucchini must be very dry to store safely – 3 to 8 percent humidity. If you want to double check your humidity levels in your dehydrated foods, you can buy a hygrolid, which is a hygrometer that fits onto the mouth of a wide mouth mason jar. I store my dried zucchini in vacuum sealed mason jars, where it easily keeps in good condition for over a year, if it lasts that long. 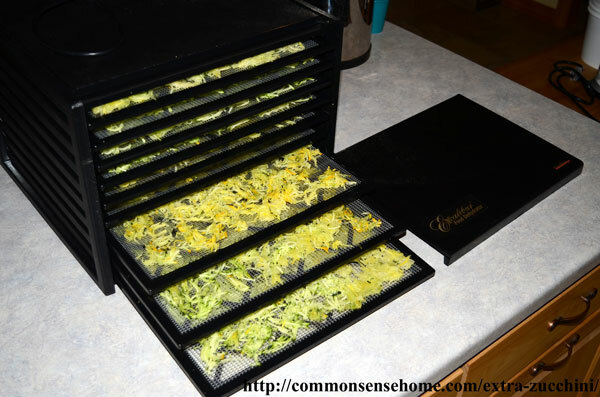 I love that dehydrating allows you to store a huge amount of zucchini in a very small amount of space. 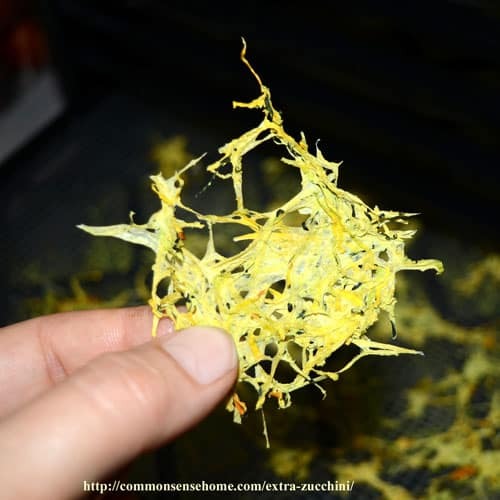 Now that you have your dried zucchini prepped, you can use it for all sorts of recipes. With the fine shredding, it crumbles very easily into tiny bits, or you can pulverize it into powder in a blender. I add it to spaghetti sauce for extra veggie goodness and thickening. 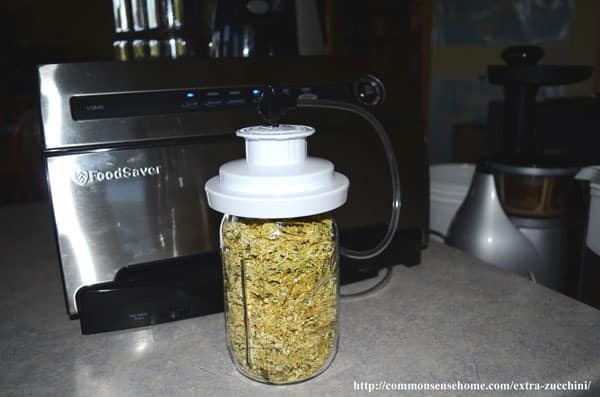 I use it to add bulk to creamed soups, such as cheesy broccoli soup. You can add a quarter cup into most bread or quickbread recipes without otherwise adjusting the recipe to get more veggies in. The powder can be added to smoothies, since the flavor is very neutral. You can even sneak some into no-bake cookies like cranberry-walnut powerballs. Just add to the dough like you would any other dry mix in like fruit, coconut or nuts. Easy! Once you start using your extra zucchini this way, you might find like I did that you're even willing to take overgrown zucchini from your neighbors just so you can have a bigger stash. what make/model dehrator do you use? 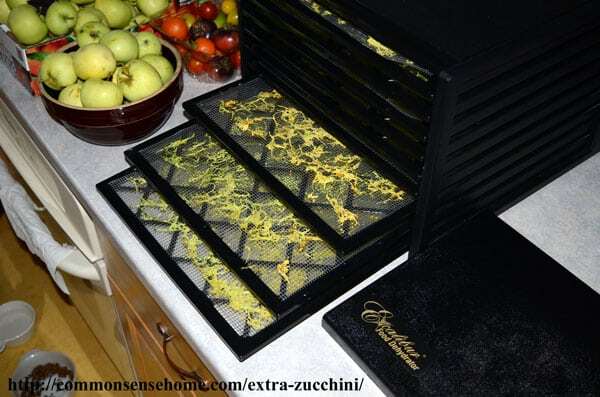 I have the Excalibur 3926TB Food Dehydrator, Black with nine trays. It worth the investment if you do any serious amount of drying. Me too,Prepped Chicks recommended it to me and it was one of the best recommendations ever! I put all those extra veges from the garden, especially at the end of the season when you’re tired of canning, dehydrating and freezing, into the blender and puree. Then put a quart at a time into freezer bags and freeze. This pureed vegie stock makes a tasty and nutritious addition to soups and stews all winter. 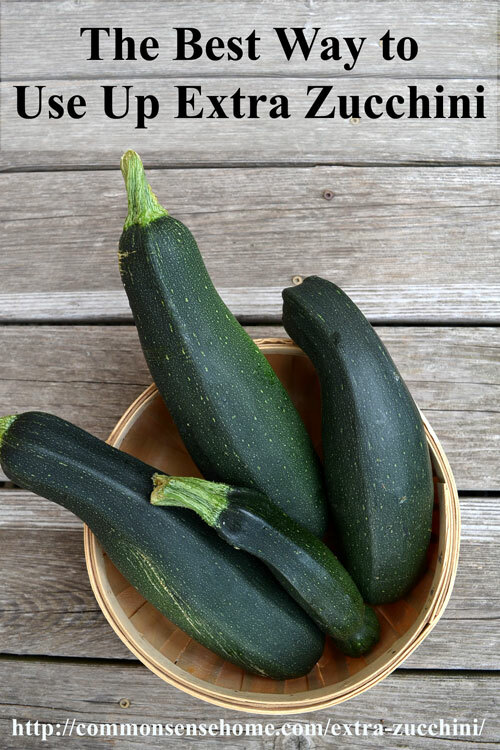 The bonus is that it’s always different depending on what went into the stock on a particular day, but you can always count on quite a bit of zucchini. Do you blanch it first? I am new to this so that is why i am asking. No blanching required for this one! Thanks for this! Great timing, too–if I don’t make it out to my squash plants within 3 days, the boats appear. I’ve got my first batch drying in the Excalibur now–it is AMAZING how much they shrink! I used chunks instead of grating so am a bit concerned about jar humidity. Do you recommend just keeping them in longer til they are 100% crisped? Yes. Humidity levels are extremely important for long term storage. Moisture will migrate out of the centers of chunks (even when the surface seems dry) and cause mold. If you don’t want to get them super dry, you can place the mostly dry squash in the freezer. They’ll still take a lot less room than squash that hasn’t been dried. I just grate my zuc, place it in a ziplock bag and freeze. It can then be added to couple, used in cakes etc. I love making country ratatouille! We eat it with everything, even on the bread for breakfast. Do you have a favorite recipe? I’ve never made it before. Thanks everyone for all the ideas! my zucchini this year made 2 types of relish and zucchini pineapple which is very good. Also did my fair share of bread that is being stored in jars instead of the freezer. didn’t think i was ever going to finnish the zuc and i didn’t have as much as you apparently had. Some years the zucchini goes a little crazy.